Heat oven to 350°F. Spray cookie sheet with cooking spray. In medium microwavable bowl, microwave goat cheese and whipped cream uncovered on High 30 to 60 seconds or until softened. Stir in green onions, garlic, pepper flakes and salt. In another small bowl, mix bread crumbs, Parmesan cheese and melted butter. Divide goat cheese mixture evenly among pepper halves. 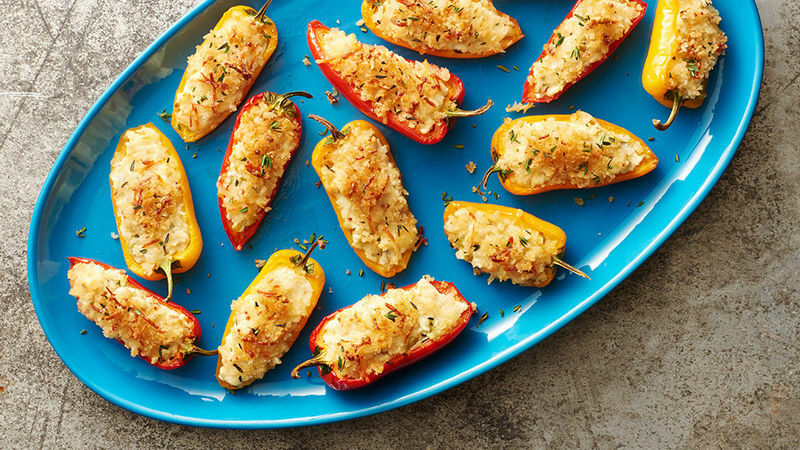 Sprinkle peppers with bread crumb mixture; gently press into goat cheese mixture. Place on cookie sheet. Bake 30 to 34 minutes or until tops are light golden brown and peppers are tender. Sprinkle with thyme. Serve warm. Feel like adding a little pig to these pick-ups? Top with crumbled cooked bacon. Using a serrated knife for cutting the peppers allows you to easily cut the stem in half, if desired.